Mankind is in a remarkable position. We live in a universe of physical and metaphysical laws, a place of harmonious arrangements of multitudes of diverse creatures. But, the remarkable thing I mean is that we humans take a look around and say: “Well, this is certainly a harmonious arrangement of multitudes of diverse creatures we have here,” like we’d just arrived, and it was new and different. Sometimes people will comment on the fact that baby animals can walk almost immediately, whereas human children take almost a year to figure it out. I don’t think this is a sign of human weakness. I think the baby is approaching gravity on more equal terms than the foal. The foal walks because that’s how it is. The baby, however, requires time to consider this new and interesting proposal. And the same goes for time. I could just come back and tell myself what to do. But I haven't, so I must not figure it out! We are in time, and subject to its laws in lots of ways, but we rise above it enough to look at it from the outside a bit. And, the subjection frustrates us. We really want to know how things are going to work out now, so that we can plan for them, or just see how cool they are. We really don’t want to have screwed up so badly last week. We want to know what ancient Rome was really like, etc. So, it’s pretty clear why people like the idea of time-travel. However, there are good reasons to prefer the old reliable cause and effect arrangement, as the concept of time-travel has some intriguingly severe limitations. There are lots of paradoxes and attempted fictional fixes to those paradoxes, and we could go on way too long about those, but it seems to me that one of the central problems we run into when we play with this concept, is freedom. If we imagine a completely deterministic universe (which, incidentally, makes for boring stories), time-travel might fit in pretty well. If everything is completely determined by what came before it, then there’s no particular bother about something looping back, or jumping forward, and causing stuff at numerous points in time. Everything just falls out the way it does. But, if we acknowledge that human beings have freedom -- that we can choose to do, or not to do -- then our problem isn't just a matter of what did or will happen, but of what could happen. If I’m free (I am), I could choose to kill someone (not my plan). If I could go back in time, I could choose to kill my father before I was conceived. If I did that, I wouldn't exist to become a patricide, so my father wouldn't be killed, so I would exist and could kill him, and so on. This is a paradox kids, and they can’t exist. Think about Back to the Future. When Marty is standing there at the dance, and his dad isn't wooing his mom, and he and his brother and sister are fading into nothingness, what exactly is going on there? We could probably make something up to justify this strange “it takes time for the timeline to change” thing (time-time? ), but clearly the purpose of it in the story is two-fold: it lends a sense of urgency to the situation, and it allows for human freedom in a universe with time-travel. And yet, does it really? 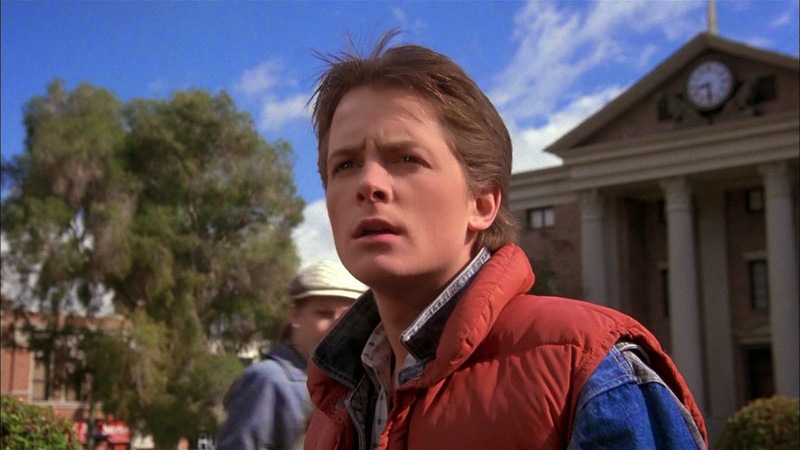 At the end of that movie, Marty has become some kind of strange alien being, the sole survivor of an annihilated universe who has (unwittingly to be sure) totally overridden every decision made previously by the members of his family (and Biff, and probably everybody else) without their consent or knowledge. It’s kind of eerie.